LESSON 1: What is "Radiation?" LESSON 6: The Nature of Light: Just a Wave? Students will continue to consider the mathematics of the photoelectric effect, including the impact of the threshold frequency on the kinetic energy versus frequency relationship. A mathematical model may need to become more sophisticated as our understanding of a phenomenon becomes fuller. The photoelectric effect is complex and our mathematical model will need to be adjusted to reflect its complexity. Evaluate the claims, evidence, and reasoning behind the idea that electromagnetic radiation can be described either by a wave model or a particle model, and that for some situations one model is more useful than the other. Recently, we've been studying the photoelectric effect (HS-PS4-3). As a final step in this process, I want students to appreciate the power and the limitation of the mathematical model that allows us to predict the kinetic energy of the liberated electrons as a function of the frequency of the incoming light. Today's opening exercise is a bit repetitive from our last lesson, but important because half of each section missed the previous class due to an assembly. The warmup has students calculating the equation of the straight line that obviously fits the data collected from a simulation exercise last week. 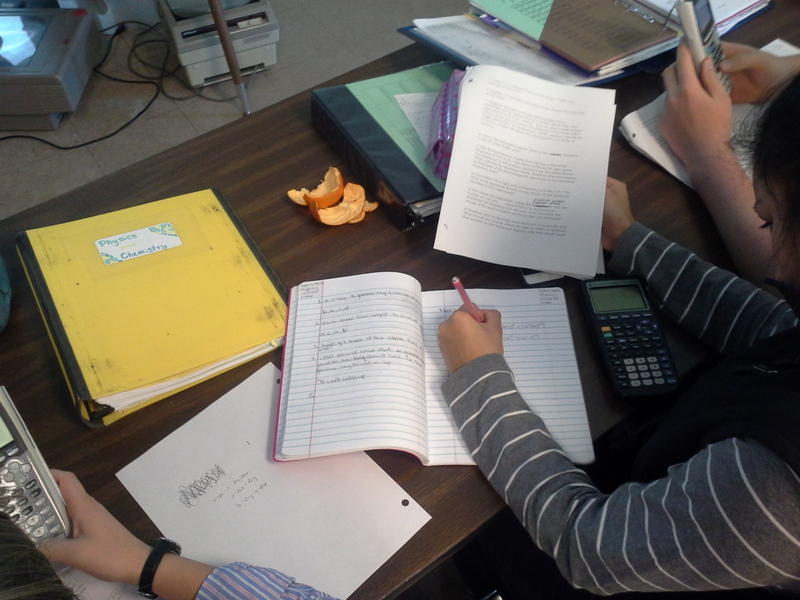 Once that equation is established, students put it to use predicting kinetic energies based on input frequencies. The second prediction results in negative kinetic energy and students are asked to consider how realistic this is. Once we establish that these negative predictions are invalid, we break the function into two parts; above and below the cut-off frequency. I share this image and tease out the different reaction to light above and below the cut-off frequency. Finally, I want to generate a function that is based on the cut-off frequency. I show the following slide and students follow along as I show the algebraic steps to creating a kinetic energy equation that folds in the cut-off frequency of the host metal. We end this segment of class with a quick review of the meaning of each variable. We are now ready to do a quick practice problem. I hand out a set of questions (a "mock" quiz) that has two purposes. The most immediate purpose is for it to serve as a practice problem for today's lesson. I direct students to question #9 and ask them to try it with our latest lesson in mind. In addition, students use this problem set as a way to self-assess their readiness for a future quiz. The quiz is based on these questions and solutions to this mock quiz are posted on-line. In this manner, students can be self-sufficient while prepping for the quiz. 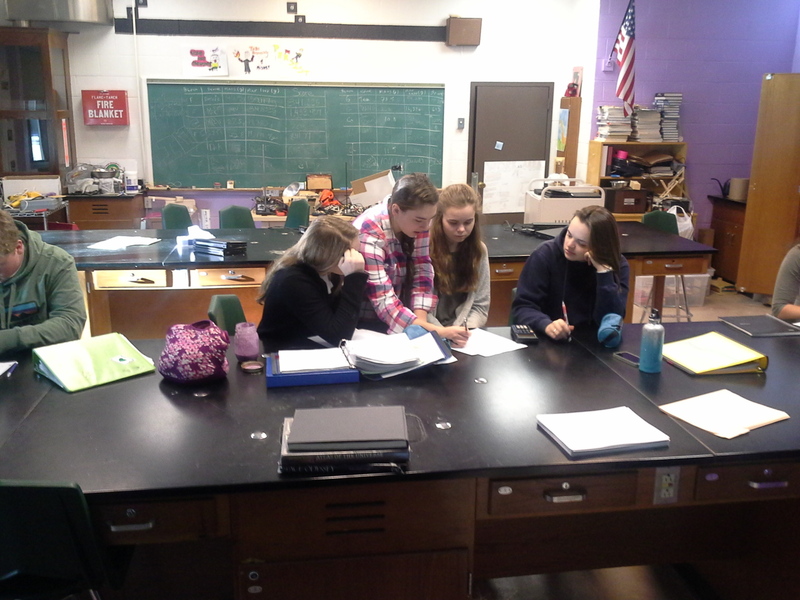 Students work individually or in small collaborative groups. I circulate to support students who are struggling and to affirm those who are not. Here, a student moves from across the room to work with some friends who were struggling. She has overheard the conversation and takes the opportunity to share her insight. After ten minutes or so, I show some solutions on the Smartboard, stressing the possibility that, for each question about kinetic energy, there can be two answers - one for each of the two different values of Planck's constant ("h") that we've been using. To wrap up today's work - and, more generally our work with photoelectricity and electromagnetics - I provide students with a set of conceptual questions about the photoelectric effect. These are questions that can be answered without using a calculator. I ask students to work individually, referring only to their own notes, for about ten minutes. After that time, I ask them to "turn & talk" with a neighbor to discuss their thinking about these questions. Having spent some private time addressing the questions, and some semi-public time chatting with a neighbor, students are primed to make contributions to the larger group. I facilitate this discussion, highlighting the logic of each question and getting a better sense of their conceptual understanding. Here are solutions to the conceptual questions, with a bit of the reasoning used in class. The review of these questions brings us right to the end of class. Though some assignments are yet to be collected, this also marks the end of instruction for this unit; we begin some new physics in the next lesson.